You’ve set your book launch date. Next – and this is a surprisingly scary – you will announce it to the world. But let’s backtrack a bit. Many, many months before the launch date (in my case, years), you should create a blog (or website – I use the terms interchangeably as in our case they are really more or less the same), which is the perfect place to announce the exciting news of your soon-to-come book. Why do you need a blog? It’s like this: Much like a realtor might learn in her first ever real estate class that Location, Location, Location is the mantra in the real estate business, a self-publishing author should learn that in her business it is Content, Content, Content. It has to do with why people buy your book. Yes, they might like your appealing cover, (so think long and hard about putting such a thing as a toilet on it, like SOME authors I won’t name seem to be doing). Yes, they might like your title (oh God, please let them like the title, it took so long to decide on the damn thing). Yes, they might think your price is reasonable and yes, your book might come highly recommended by a friend. But above all, they will want to buy your book because they like your voice. They like how you tell a story, ANY story, and want to read more of your stuff. Some of my most positive reviews have statements such as “She talks to you as if you were sitting across from her in her kitchen over a cup of tea” or “I felt like I was walking up that mountain right alongside her”. It’s not like I decided one day I’d write like that. It evolved over many months of blogging. You hope that with your blog you will draw in new readers who come looking for information or entertainment (ideally, both – I don’t know about you, but I have no patience for mindless information if I can get it elsewhere AND be entertained by it), and that by the time they leave, they will have come to know and like you a little bit more, enough to come back and perhaps even subscribe to your updates. You keep giving them interesting content (without spamming) and your hope is that on a subsequent visit they will see the picture of your book right there on your blog and, having just laughed about something you said, decide on a whim to buy it. It really is that tedious, pulling in one reader at a time. This is what my expat blog looks like (after several revamps – I’d be embarrassed to show you the very first version). Your blog is your portal to your Author, Inc. business. 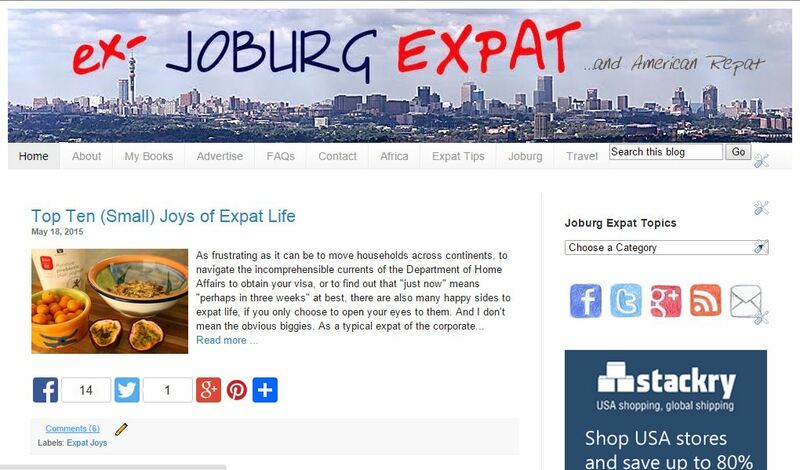 In my case, I have two blogs: one about expat life and travel (Joburg Expat), where my tales of (mis-) adventure originate and which provides the basis for my collection of travel memoirs (okay, one day – for now there is just one in the collection), and another one which is my author profile (Eva Melusine Thieme, Author), where I focus on my books and author news. If you’ve set your launch date but don’t have a blog, create one. Use WordPress or Blogger like I have done, or Google what else is out there and pick one. Don’t fret too much about the design, but do make it look simple and uncluttered. Write a good About Me page – this is your introduction to the world. And then set about posting content. Anecdotes that might make an appearance in your book. Interesting information about those topics. How you wrote your book. Or, I don’t know, maybe about how you were attacked by a squirrel flying out of your fireplace. If you’re a writer, chances are you will have SOMETHING to write about. Posting new content once or twice a week is a good pattern. If you create good content, your readers will come, trust me. Okay, now coming full circle to today’s task on your Book Launch Checklist: Once you’ve picked your launch date, announce it (with big fanfare) on your blog. If you already have cover art, great, put it there. If not, involve your readers and ask their opinion, let them vote on several drafts, etc. Post a link to where people can sign up for your newsletter, which you will create later to notify them once your book has been published. I know this was a longish to-do item, but hopefully you already have a blog and then all you needed to do was announce your soon-to-be-born baby book. Now you’re in it for sure! Let the countdown begin!